Want a more Nostalgic look and feel? Our new wooden windmill towers are a masterpiece in design. Manufactured in the U.S. with cedar colored pressure treated wood, this windmill will look great for a long time! 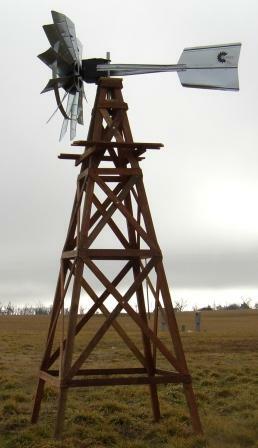 Assembled height of the windmill and head is 19 feet. If you're looking for everything you need to aerate your pond, this is it! Our Deluxe Windmill Aeration System pumps tons of air, even more than other companies that sell "dual diaphragm" models. The secret is our new, patent pending BalCam Technology that allows us to pump more air with a single diaphragm. The benefit to you is that you'll have less moving parts, less bearing's and less diaphragms to service and maintain. This unit is rated at 3.0 - 4.5 CFM and includes everything you'll need to install your unit and begin aerating your pond. It also has a 5 year warranty on the compressor which is unmatched in the Industry.. This windmill is loaded and is a great value. No one else offers this much air and added accessories for the price! Perfect for a 2 or even 3 acre pond.